That time of year is here again when most people start to think about spring house cleaning. 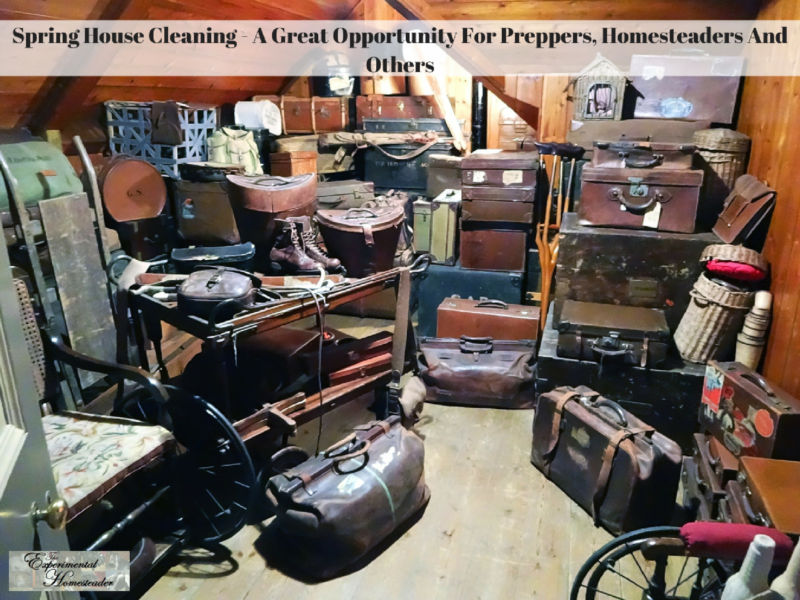 While it is still too early in many places to open the windows and air the house out it is not too early to start clearing clutter and donating or selling what is useable. This presents a fantastic opportunity for homesteaders and preppers alike – not only to save some money but to pick up some items you need for your homestead or bug out bag at a reduced price. Now is the time to keep an eye on the thrift shops, the classifieds and do some spring cleaning of your own. You might even end up with some items you can trade with someone. Below I share my four tips on spring house cleaning. The closet is often the easiest place to start. Get rid of old clothes, shoes or anything else in your closets that you no longer want or use. Closets are a great place to store stuff and keep it out of site so they often become cluttered. The easiest way to clean this space is to take everything out of the closet – set aside one day per closet in your home – you might need that. Remove all the clothing, boxes, etc. Sweep the floor, remove the cobwebs and wipe the walls down. I have wood floors in my closet so I take this time to mop those. This is a good time to put a fresh coat of paint on the walls and ceiling area of your closet if needed. Go through the items one by one. Get someone to help you if you have a hard time making decisions about what to keep and what to toss. I have a hard time deciding on what clothes to keep because they still fit and clothes can be expensive however let’s face it, I don’t need 50 t-shirts! Use a box or garbage bag to put the stuff you don’t want in. Do not set it aside. As each box or bag fills up send it to your vehicle if you intend to donate it. I always take my boxes and bags to our local thrift shops before they close that day. If I don’t I end up going through them again and keeping things I don’t need. Some items are valuable and can be sold or traded. List those online that night or take them to a pawn shop or other place that buys items. Again, if you don’t do this right away you may be tempted to hang on to those items another year. Do this for every closet in your home. When you are done, you are going to be glad you did. Before you put items back in the closet, consider how you are going to organize that space. Do you need more shelves? Plastic tubs to store stuff in? Get those items installed first. In fact, it is a good idea to make a list ahead of time so you have the materials you need on hand for closet cleaning day. This way you don’t just put stuff back and end up with another mess in your closet. I know I have stacks of boxes in my home. We moved in and things did not get unboxed. Over the years we needed storage space we didn’t have. Boxes are free and they work. Then when my husband died and we had to clean out our business, we put things in boxes and brought them home. We have a case of box overload – and never mind all the stuff I get for review purposes that come in boxes. This year I have decided that as items come in, I am going to remove the items from the boxes, then refill the empty boxes with items I don’t need or want. Those items are getting donated. It is time to make some sense of this mess of boxes I have. Grocery stores and other places are often willing to give you free boxes if you call ahead. Now don’t get those boxes and just stack them up. Ask for one or two at a time and fill them up. Go through those boxes stacked in your house and get rid of stuff – or find a place for it that is not in a box. I know boxes collect dust – and are a huge allergy issue for me. Getting rid of my stacks of boxes is going to solve some of the allergy issues I have. It is going to make more floor space so I can have some shelving installed to hold the books, magazines and other items I actually want. It is going to make my home more presentable and make it possible for me to have company come stay with me. Think of all the things you can do with the space boxes now occupy in your home. Spring cleaning is a great time to take inventory – of your pantry, supplies, clothing and more. Gardening season is just around the corner. Do you have seeds stuffed on shelves or in boxes? We just found a huge stack of seeds last night that I had set on a shelf and forgot about. How much food is in your pantry? Are there things you are out of? Take this time to check the dates on your water supply, food items and more. Go ahead and rotate them so the items about to expire are the first ones you use up. If you are like me, maybe you buy a few items at a time – for example, I love the Modern Gastronomy method of cooking – however I cannot afford all the items I need at one time – so I buy one or two as I can. Now I know I still need two more items – a special slotted spoon and a pH tester for food – before I can start to use the supplies I have bought. This is a great time to make note of those two items so I can move them to the front of my buying or reviewing list. Maybe you bought a skirt or shirt but have nothing in your closet to match it. Now is the time to make a decision to get rid of it or buy the matching item. Making the decision of what to do with the items you no longer want or need is the hardest part. I use the box and bag method. I use a bag for what I am going to donate and a box for items I intend to sell or trade. I do not double sort. When I do my spring cleaning the items I am getting rid of go in either the bag or the box. Double sorting leads to keeping things you don’t need. I do not spend a lot of time thinking about the things I decide to get rid of either. That can make decision making even harder. This year I intend to clean out at least one room of my home – maybe more. We will see how much time allows me to get done. I am still struggling with dealing with my deceased husband’s belongings. It is hard to let go of some of them – but it is time.